Maintaining a building is expensive: it costs many times more to run a building over its lifetime than to build it, yet maintenance is often not accorded the priority it warrants. A poorly maintained building will be a drain on resources and will impair building use, whereas a well maintained building will function smoothly and represent an appreciating asset to its owners. Building Maintenance is a core text on the technical aspects of maintenance for undergraduate degree students on built environment courses, particularly building surveying and facilities management. It addresses the ‘who, what, where, when, how and why’ of maintenance activities and shows that maintenance should be considered seriously at the design stage. Extensive case studies illustrate what can go wrong, how to put matters right and how to get it right first time, next time. A professional approach is required to building maintenance. 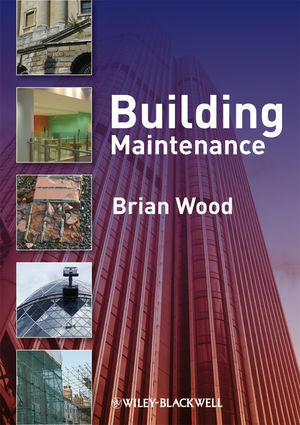 By encouraging maintenance managers to stand back and take a strategic view of building maintenance alongside their day-to-day tasks, this book will help practitioners and students to achieve that. Brian Wood is a senior lecturer in the School of the Built Environment at Oxford Brookes University. He previously worked in the public and private sectors as an architect and surveyor. He was a contributor to Quality in Traditional House Building, published by the Building Research Establishment, and is author of Building Care (Wiley-Blackwell). Foreword by Professor Jim Smith. Maintenance: what is it; what is it for? What, where, when, how, (and how often), who and why. Case study: estate strategy in a UK university. Reminder: the client pays the bills. How to determine and differentiate wants and needs. How often to seek advice. How soon to seek advice. From whom to seek advice. Needs of the future: looking ahead. A worked example – developing a checklist related to expectations. Case study: maintenance delivery in a UK university. Case study: a local authority. 8 Building defects and avoidance. Defects at the inception/pre-design stage. Defects at the design stage. Defects occurring during the construction stage. Defects while the building is in occupation. Development control: town and country planning. Health and safety: Construction Design and Management Regulations. 10 Defect recognition and rectification: General. Recognising, recording and reporting condition. Checklist: defect recognition and rectification. 11 Defect recognition and rectification: Foundations, basements and external works. Avoidance of problems in future. 12 Defect recognition and rectification: External walls, doors and windows. Double and triple glazing; replacement doors and windows; PVCu. Cills, heads, reveals and canopies. 13 Defect recognition and rectification: Chimneys, roofs and roofspaces, rainwater disposal. Roof forms and related details. Dormer windows and other penetrations. 14 Defect recognition and rectification: Floors, stairs and internal walls. Means of escape; protected routes. 15 Defect recognition and rectification: Building services. Plumbing: water, waste and soil. Fire, security and other specialist services. 18 New life in the building. Pros and cons: why POE? Refreshing the organisation and staff. Addresses the who, what, where, when, how and why of maintenance activities. Includes summaries of symptoms, causes and rectification. Full of checklists, case studies, worked examples and flow diagrams. Illustrated with diagrams and photographs of building defects. Addresses sustainability issues relating to maintenance. Written in a lively, engaging style.